Before the well-deserved summer break, a quick update on everything 2001-related around the web. 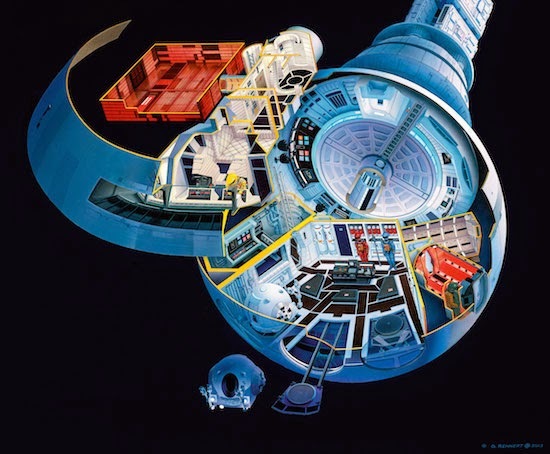 Oliver Rennert created this beautiful Discovery I cutaway illustration for The Making of Stanley Kubrick's 2001: A Space Odyssey (now due late July - early August). Now he is selling a high-quality reproduction as a limited edition of 500 pieces, numbered and signed with certificate of authenticity. It is a Giclée print - almost indistinguishable from an actual painting in three primary sizes (note: dimensions include a 3cm border). Price may be on the high side, but it is a limited edition and of high quality. For other sizes, please contact Oliver through his website below (contact page). Note that anything below A2 or higher than the XL will either not show enough detail or render 'imperfections'. To purchase it, contact Oliver Rennert here. More great pictures from the forthcoming Taschen's Making of Stanley Kubrick's 2001 has been published on the Vanity Fair website. Here's one, an early production sketch showing the mysterious alien artifact on the moon. 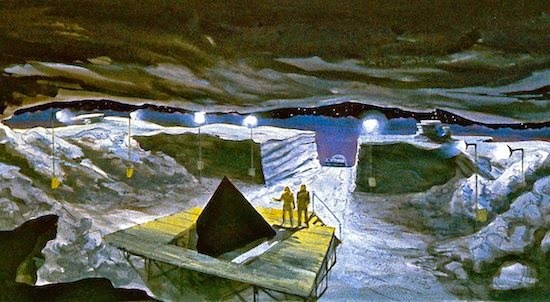 The pyramid design (reminiscent of the tetrahedron featured in Arthur C. Clarke's The Sentinel) was discarded for being too evocative of ancient Egypt and thus not sufficiently alien. Check out the other pics here. Check out the great 2001-related interviews my friend Justin Bozung has been posting on TV Store Online's Blog: Ivor Powell (part 1 and 2), Lydia Wilen, Jill Caras. 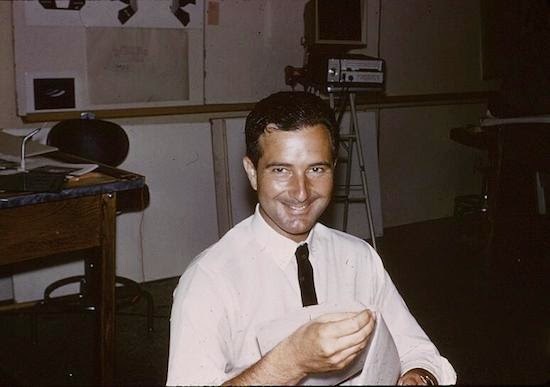 We mourn the late Frederick Ordway III, scientific consultant to 2001, who passed away on July 1, aged 87. He deserves a larger, greater post - and not only for his contribution to our favourite movie; in the meantime, check out the obituaries by New York Times and Washington Post. The Apollo 11 Moon Landing happened 45 years ago, on July 21, 1969. 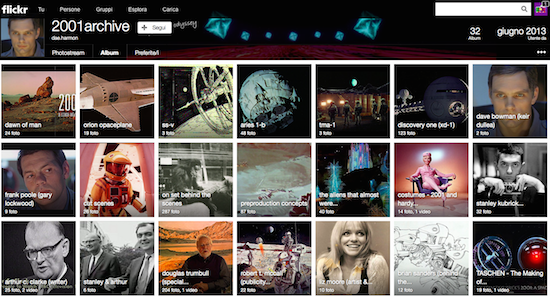 Here it is, recut to Stanley Kubrick's 2001: Space Odyssey from Nick Acosta on Vimeo. And one last thing before I go: the BEST 2001-related image archive on the Net, Dave Harmon's 2001archive (https://www.flickr.com/photos/2001archive/sets/). You'll spend the whole summer browsing it. Enjoy!